Natural And Artificial Flavors, Beet Root Powder, Citric Acid, Sucralose, Acesulfame K.
Stir 1 scoop of ElastiJoint® support formula into 1 cup (8 fl oz/250 ml) of water or your favorite beverage. Stir or blend until smooth and drink. Do not exceed 2 scoops per day. Natural And Artificial Flavors, Citric Acid, Grape Color, (Dextrose, FD&C Red #40, FD+C Blue #1), Sucralose, Acesulfame Potassium. If you are a weight-training athlete, the strength of your joints can become the limiting factor in your ability to use the heavier training poundages necessary to stimulate bigger, stronger muscles. If your joints aren't up to handling heavier weights, you're going to pay with diminished muscle gains and injuries. In short, you aren't going to make the kind of progress you desire. Worse yet, your progress may be brought to a screeching halt with an injury. Sometimes your joints can become overly stressed by heavy repetitive activity. At other times, muscles can become stronger than the joints they are attached to. In both situations, joint aches and injuries can occur. And nothing will sideline you faster than an injured joint. But there's good news. Like muscles, joints can be nourished and strengthened nutritionally. Whether you want to improve joint strength, are suffering from aching joints, or are rehabilitating an injured joint, you need to know about my amazing new joint support formula. By using an approach similar to that of building muscle…train intensely, resting, and consuming the nutrients your joints need to maximize strength and recovery. The first two are easy, but consuming the key nutrients your joints need in the right amounts is not. The reason is that the best sources of "joint nutrients" are foods that are less than appetizing... like ground-up crustaceans and chicken cartilage! Thankfully, there's a more palatable way to provide your joints with the nutrients they need, ElastiJoint. ElastiJoint is a powerful joint-support supplement designed to help maintain healthy joint function, elasticity, and flexibility. And pain-free joints help you support bigger muscles! 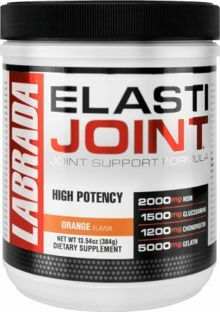 ElastiJoint active ingredients are the building blocks required to strengthen and rebuild joints…much like amino acids help the body rebuild muscle tissue. ElastiJoint has been proven to work. In fact, these ingredients are so powerful that people who have been suffering from osteo-arthritis are now turning to these ingredients for relief. Hydrolyzed Gelatin – Gelatin provides the components of collagen, which is the basis of connective tissue found in skin, ligaments, cartilage, vertebral discs, joint linings, capillary walls, and the bones and teeth. Glucosamine Sulfate - Glucosamine is a major component of cartilage. It helps the body make synovial fluid – an important joint lubricant – and proteoglycans – the large, shock absorbing molecules found in cartilage. Chondroitin Sulfate - Chondroitin is a derivative of glucosamine that supports the strength and flexibility of all connective tissues in the body. MSM (methylsulfonylmethane) - MSM is a natural, nutritional source of biologically active sulfur. The MSM in ElastiJoint provides the body with the raw materials it requires to remanufacture protein, hair, skin, and the connective tissues in joints. Vitamin C (ascorbic acid) – Ascorbic acid is essential for the synthesis of collagen and the reconstruction of connective tissues in the body. Assist your joints in recovering after workouts. Provide the building blocks for tendons and ligaments. Protect your joints by making them stronger. Strengthen joints - like strong muscles, strong joints are less likely to be injured under stress.